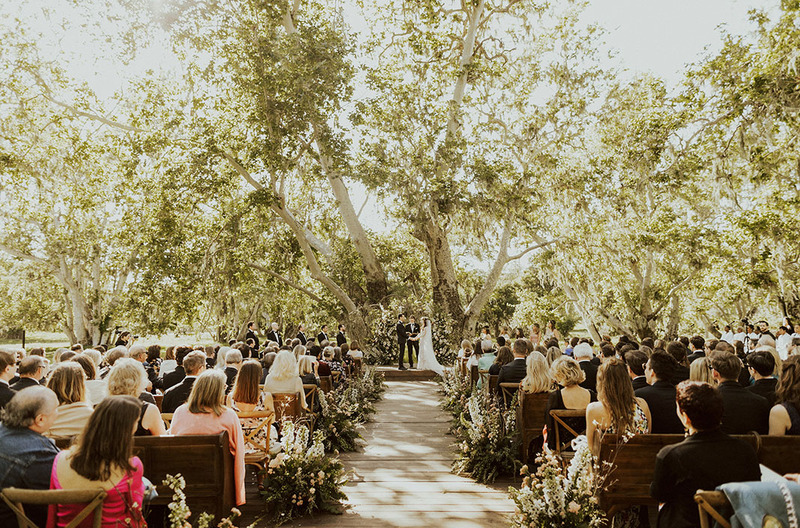 This Santa Barbara wedding weekend almost seemed like a rodeo, complete with horse wranglers, a folk band, a magician, and Dutch oven cooking… but that’s not all! 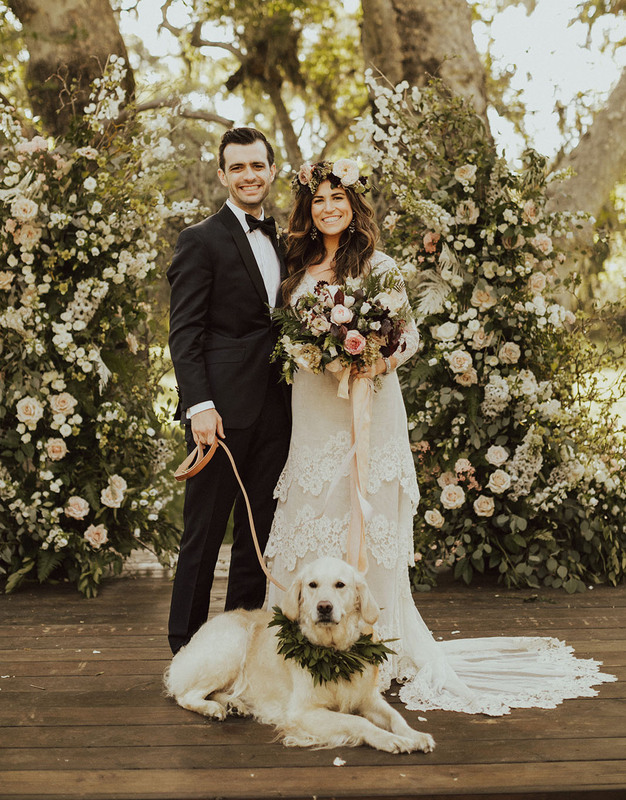 Olivia + Will entertained their guests with lawn games, he surprised his now wife with a new puppy during their First Look, they had s’mores under a grove of trees, and Southwestern-inspired cocktail hour… oh, wait, did we mention it was a black tie affair? 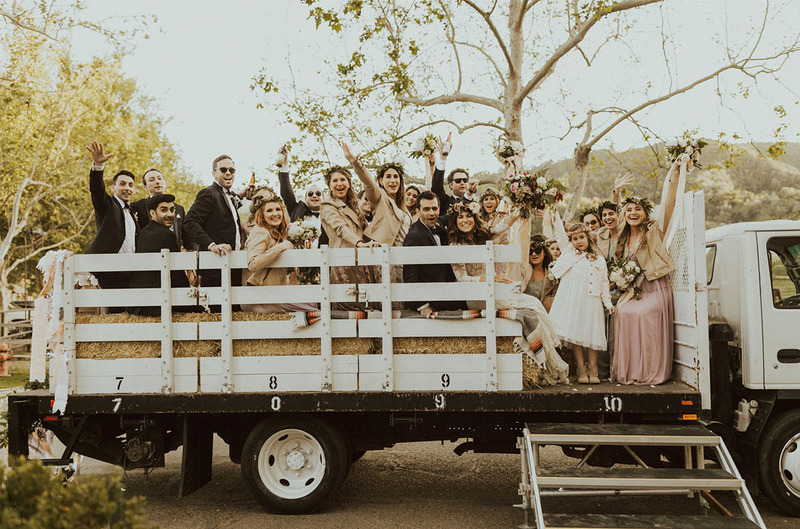 Yup, even with all the outdoor shenanigans and sprinkling of Southwestern vibes, everyone was dressed to the nines (with a few cowboys, for good measure). And it worked! 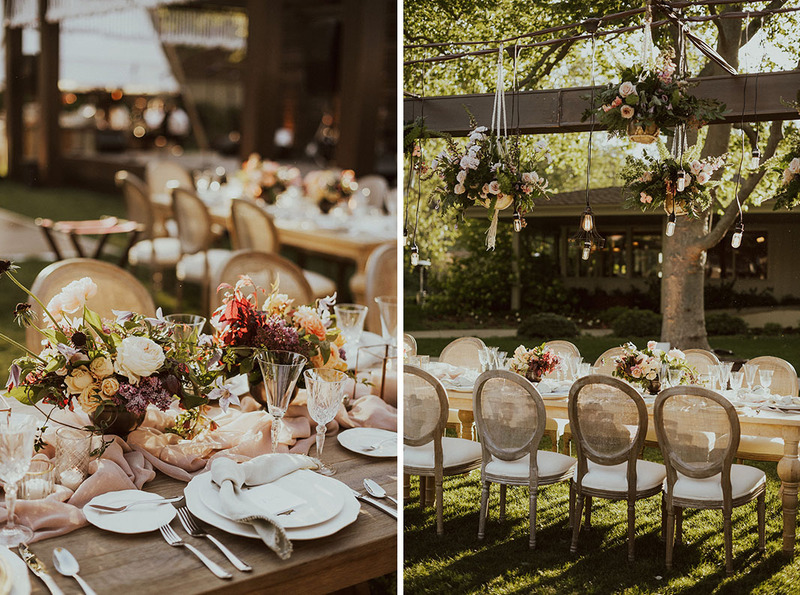 Especially with the neutral color palette and all the macramé accents, designed by La Fete Weddings. 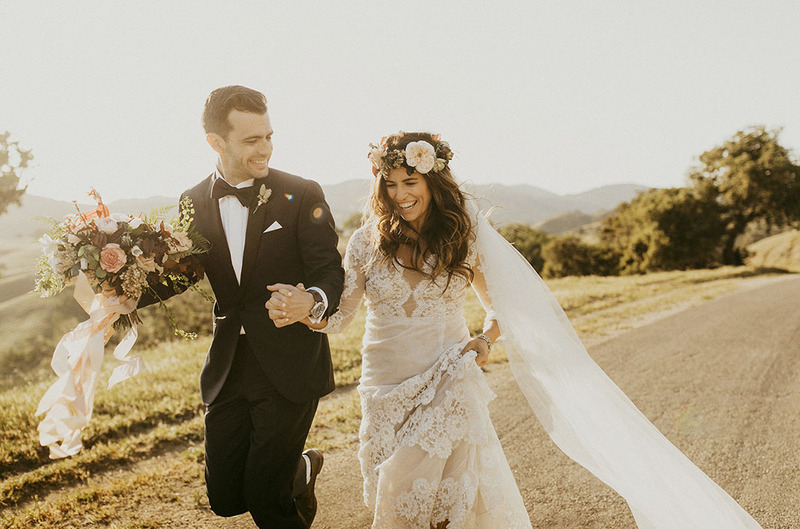 Olivia shares: I knew I wanted my wedding to be different, bold and bohemian (with a flower crown of course). 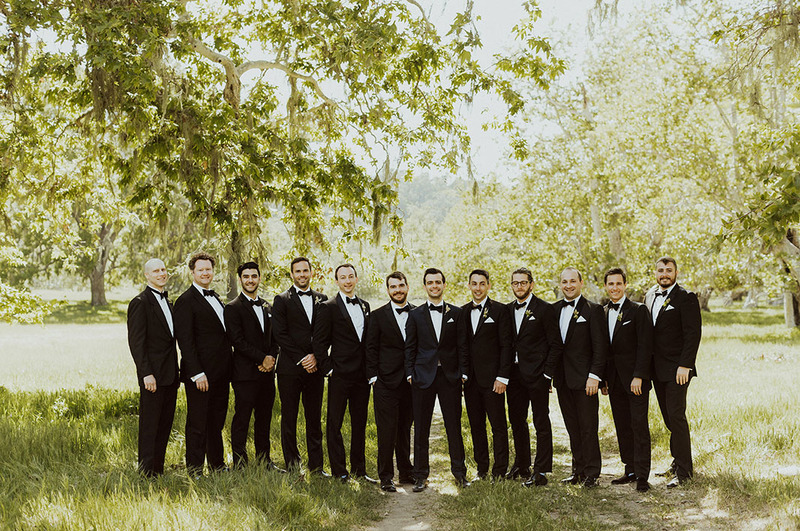 Will always envisioned himself getting married in black tie attire. We settled on a Bohemian Black Tie theme. 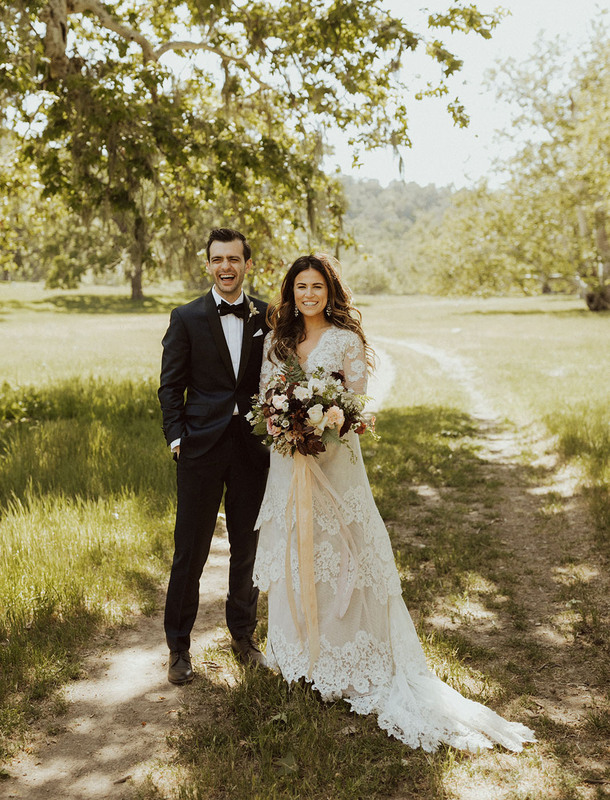 Guests wore everything from the traditional black tie, to cowboy boots, jeans and tux jackets. 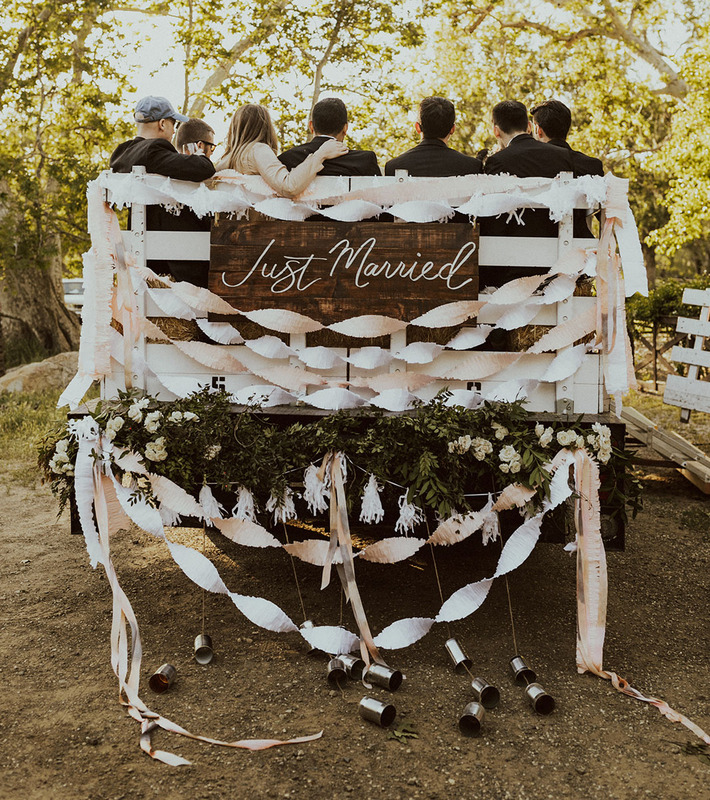 It fit perfectly with our not so “by the book” wedding vibe. 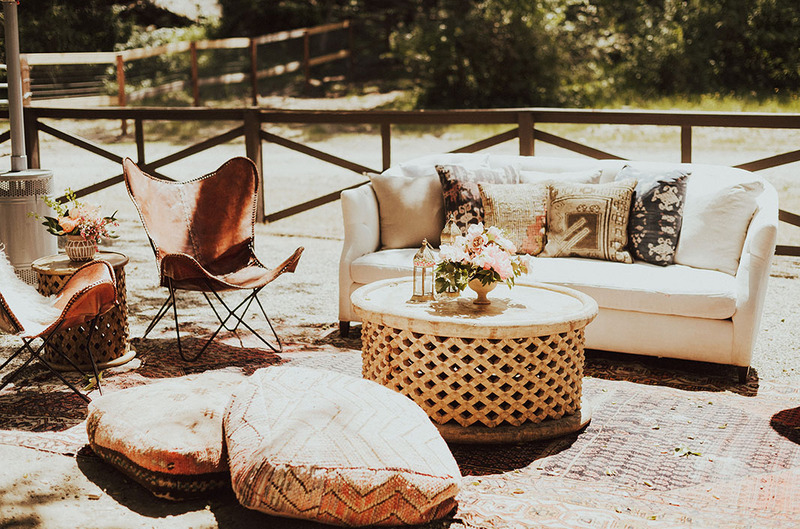 Let’s travel to The Alisal Guest Ranch & Resort in these photos snapped by India Earl! Holy smokes, OLIVA! 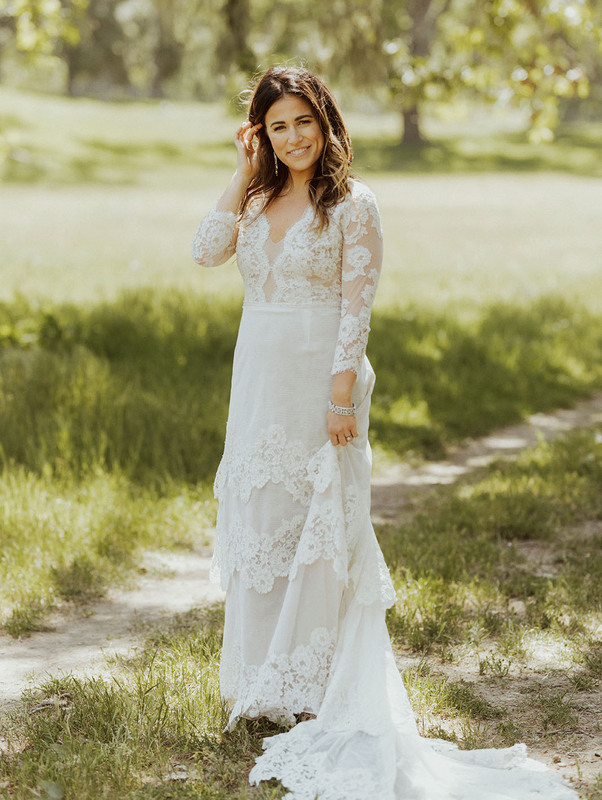 How stunning is that Jinza wedding dress, especially with the lace 3/4 sleeves?! 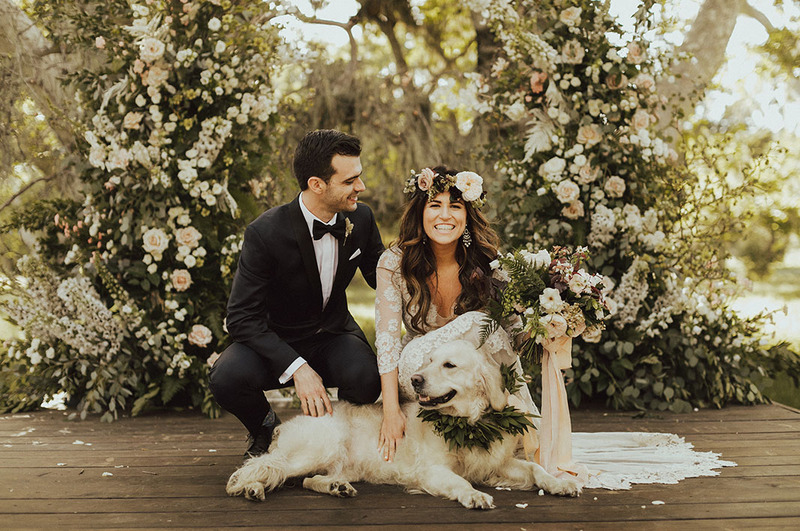 For the florals, Camellia Floral Design focused on neutral tones, accented by moody pops and a sprinkling of fern greenery. 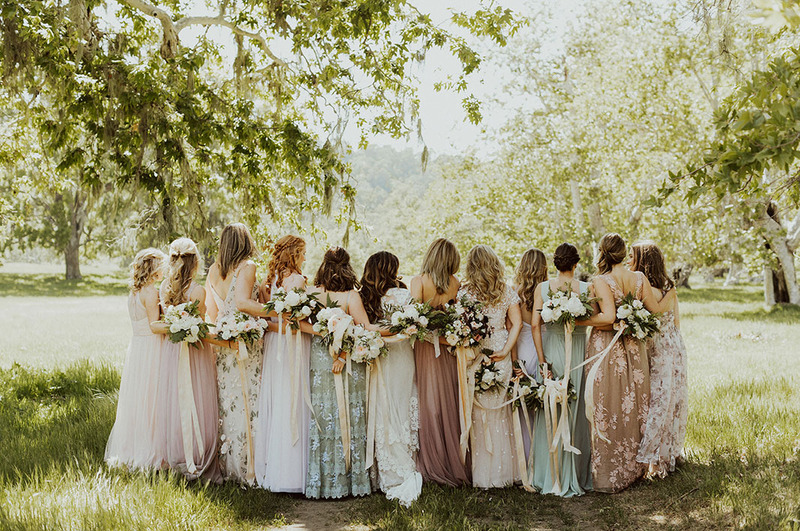 Isn’t this collection of bridesmaid gowns stunning?! Such pretty hues. 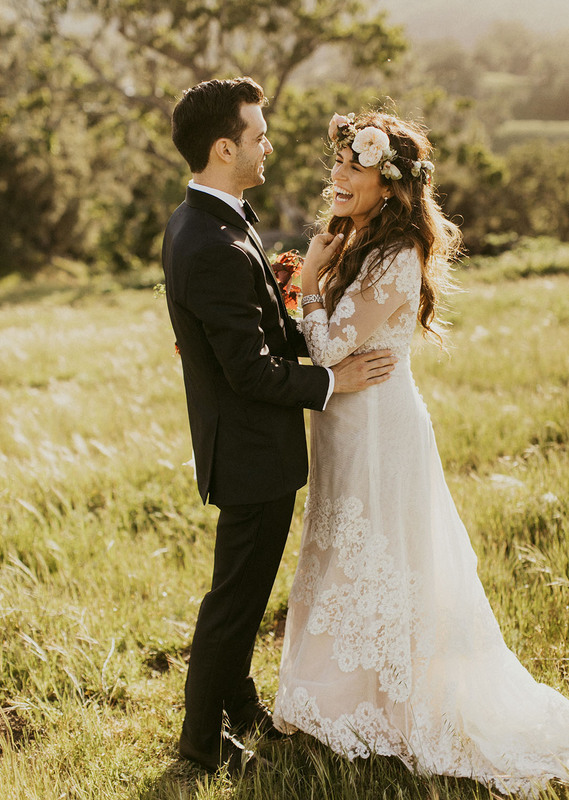 You can find similar gowns from BHLDN, Jenny Yoo, Needle & Thread, and Monique L’Huillier. 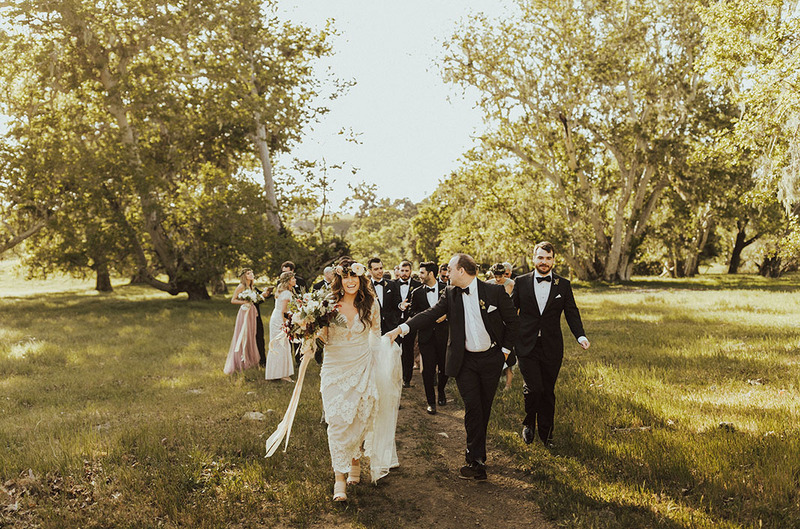 For the ceremony, O+W wanted to blend in to the beautiful surroundings of the Sycamore Grove at the Alisal (which coincidentally, guests could only get to the ceremony via a wagon ride — so fun!). 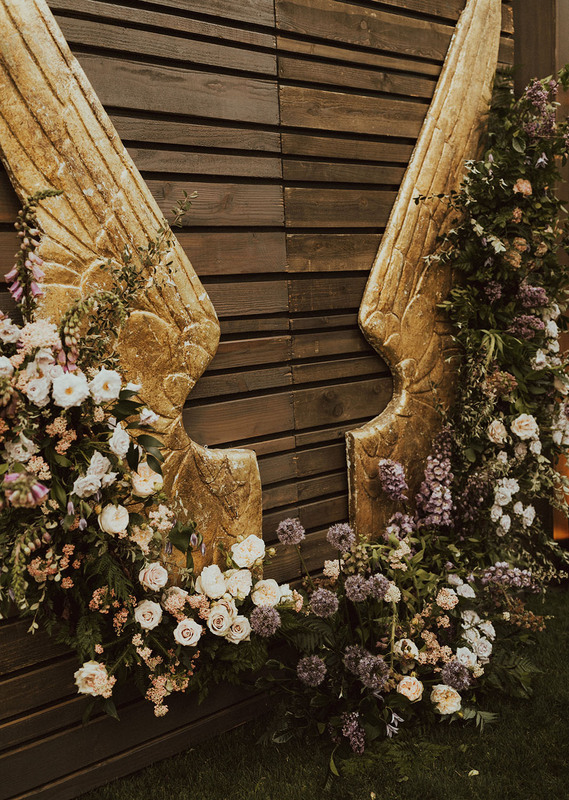 Can you imagine guests coming upon the hidden ceremony spot and seeing this altar?! 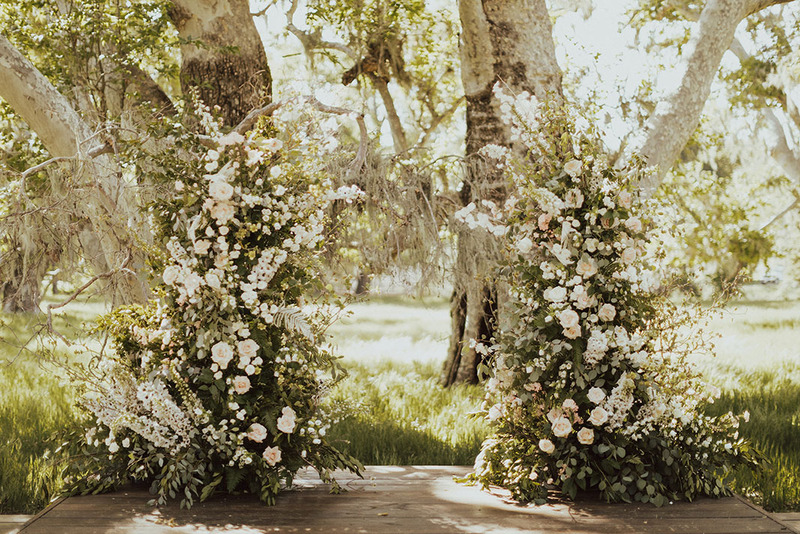 Camellia Floral Design complemented the Sycamore trees with gorgeous florals to create a natural altar. The choir was already singing by the time they entered the ceremony. 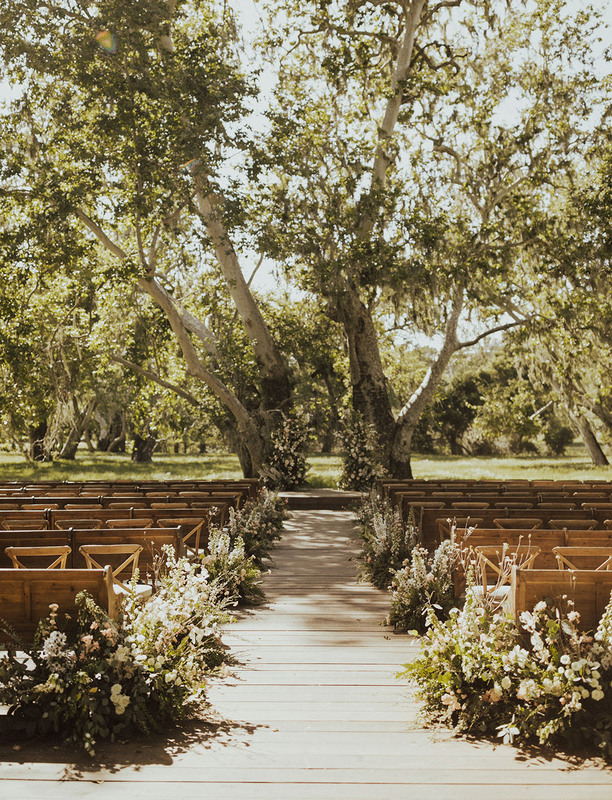 I remember sitting there with my dad and I could not wait to walk down the aisle to my soon-to-be-husband. I could already feel the energy. I was already crying those happy tears. It was incredible. 1. Our first look. Not only did Will look so incredibly handsome, but he surprised me with the news of the newest addition to our family. A puppy! A little brother (golden retriever) for our Ivy. Not to mention, our first look was an intimate affair, just Will, me and our... rattlesnake wrangler 10 feet away. 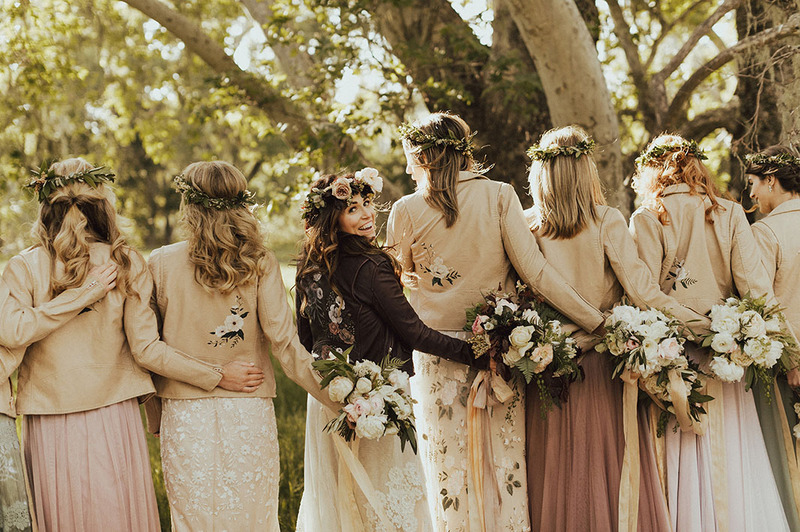 After seeing hand-painted leather jackets pop-up on Pinterest over the last couple of years, Olivia knew she had to have them for her gals! 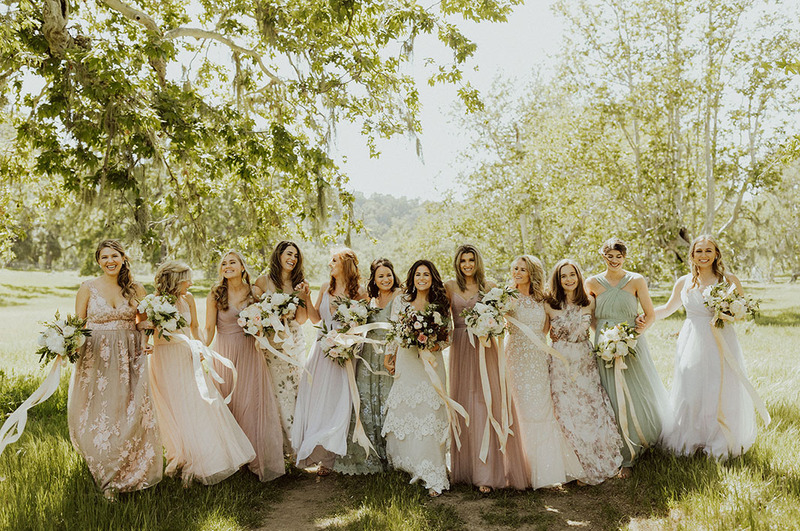 Especially since they all wore different dresses — it would be a nice momento for them to take home, and a way to tie them all together for photos! 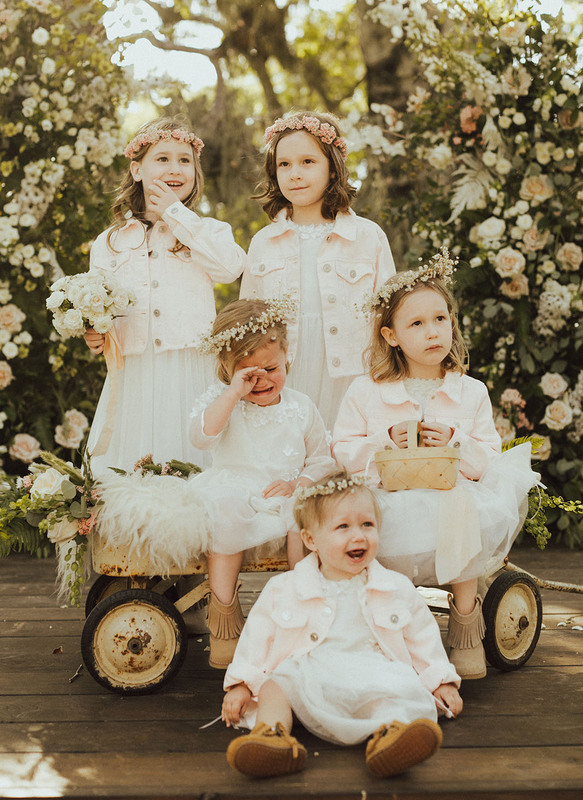 Olivia found Alyssa Frazier, an art student, who painted all 11 jackets for the bridesmaids, plus 5 flower girl jackets. 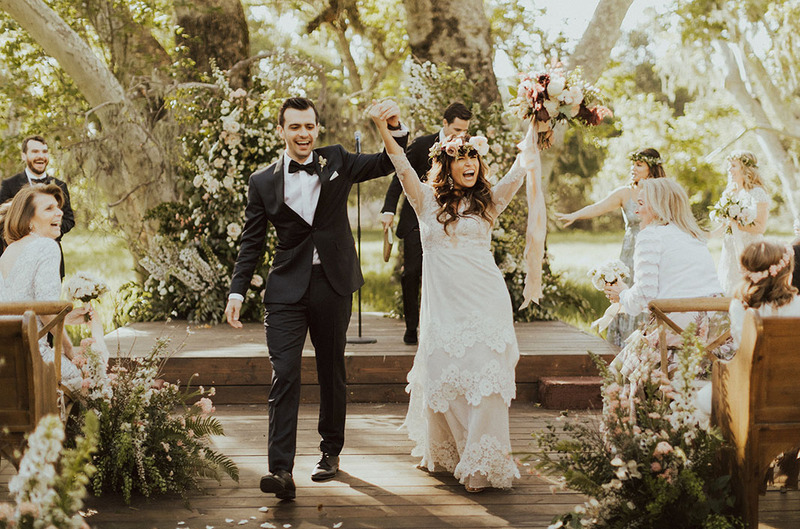 And Little Patterns crafted the hand-painted leather jacket that Olivia wore for the big day. Thinking about doing something similar? Make sure to take a peek at our How to DIY a Custom Leather Jacket article! 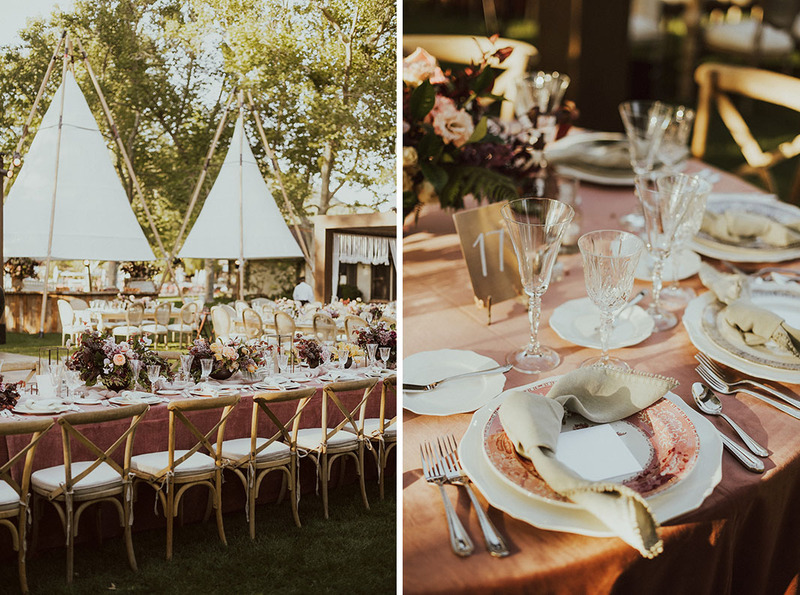 I could go on and on about our wedding style, but the most important part of all of our planning was to ensure that our guests (& us!) had the best time ever. Thanks to The Hudson Project, Will and I danced our butts off with each other, our family + friends and even got on stage a couple of times to lead a few songs. 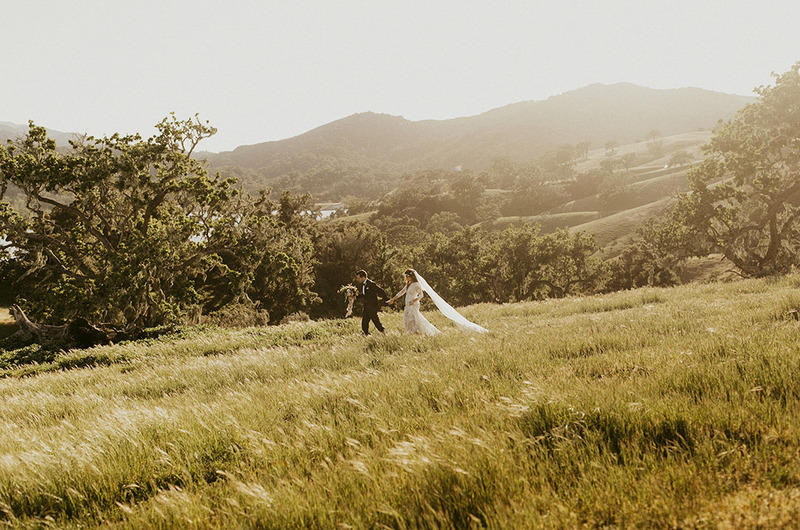 At one point, Will and I snuck away from the reception location and just took it all in from a distance. Needless to say, it was magical moment to spend together. Are you eyeing that flower crown? 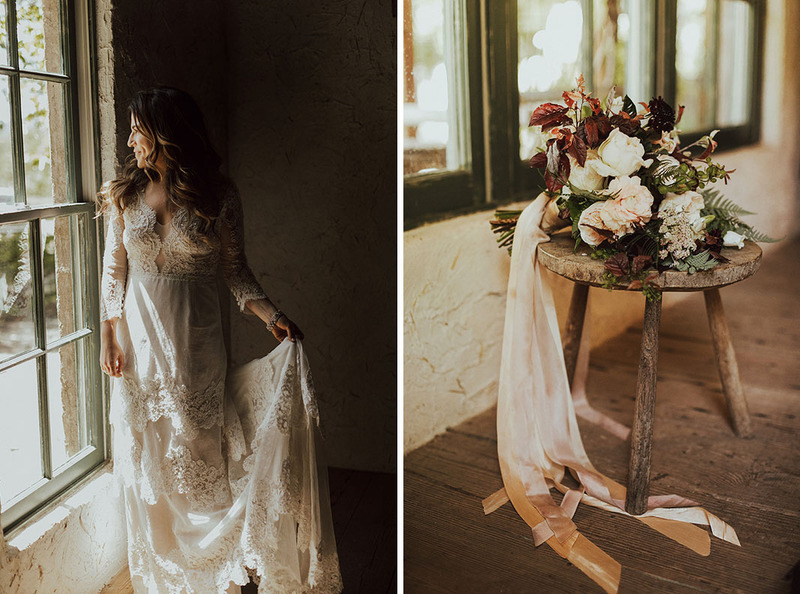 Camellia Floral Design seriously nailed the neutral bohemian vibe Olivia wanted. Yup, just one of the “buses” escorting guests to and from the ceremony site! Planning is all parts incredible, exciting, stressful and draining. And it will take up all of your free time (& free brain space) if you let it. Just as important as setting aside time together to plan is setting aside time together to do anything but plan. 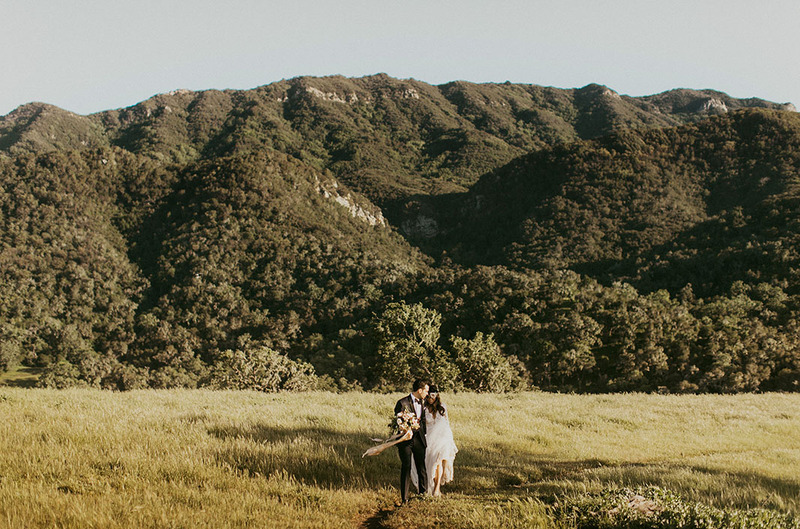 We set aside specific date nights where we didn’t talk about planning (but inevitably talked about all of the things we were most excited for about the weekend). It helped compartmentalize the times we could get excited (without getting too stressed!). 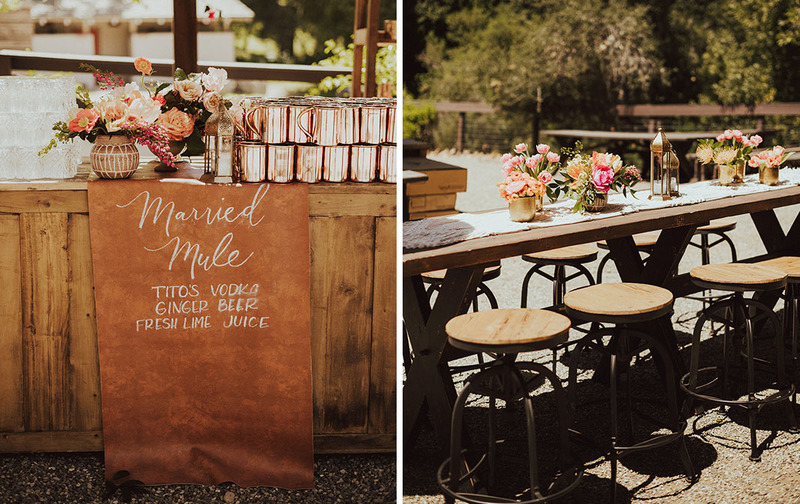 After the ceremony, it was officially time to grab a Married Mule! Walking into the reception was a definite highlight of our wedding weekend. 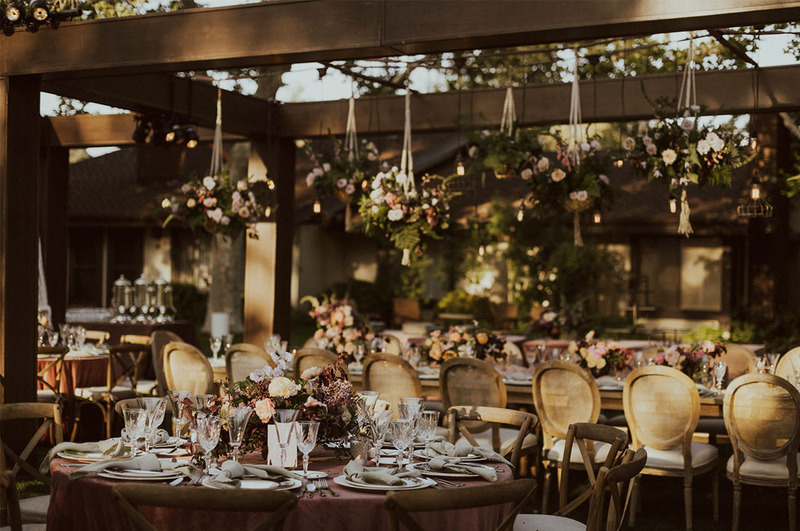 After months of planning, it was so incredible to see it all come together so perfectly in our Bohemian Black Tie vibe. 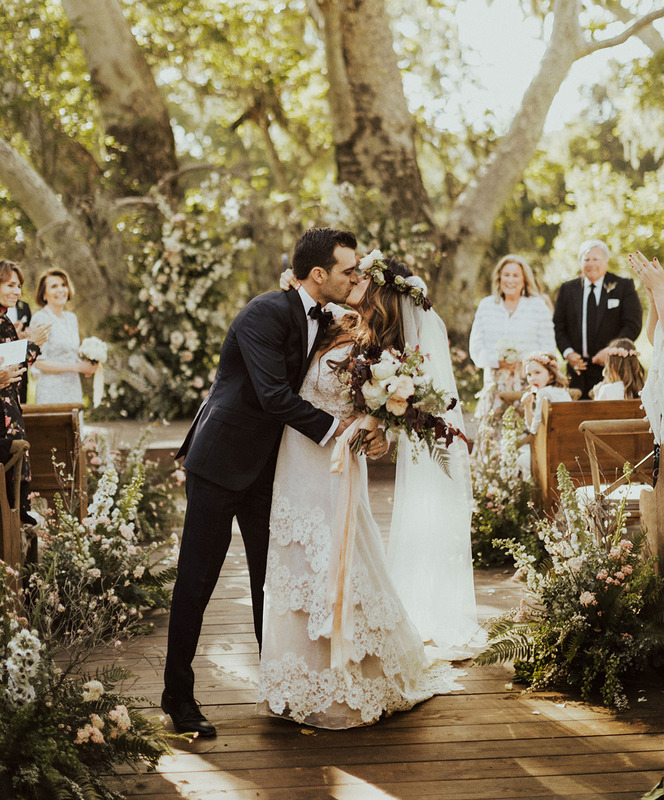 All of this was brought together by probably the most special touch of our wedding style — my mom (who played a huge part in planning) had been collecting vintage china for the last couple of years. She shipped all 260 plates from Kansas City for our wedding day. 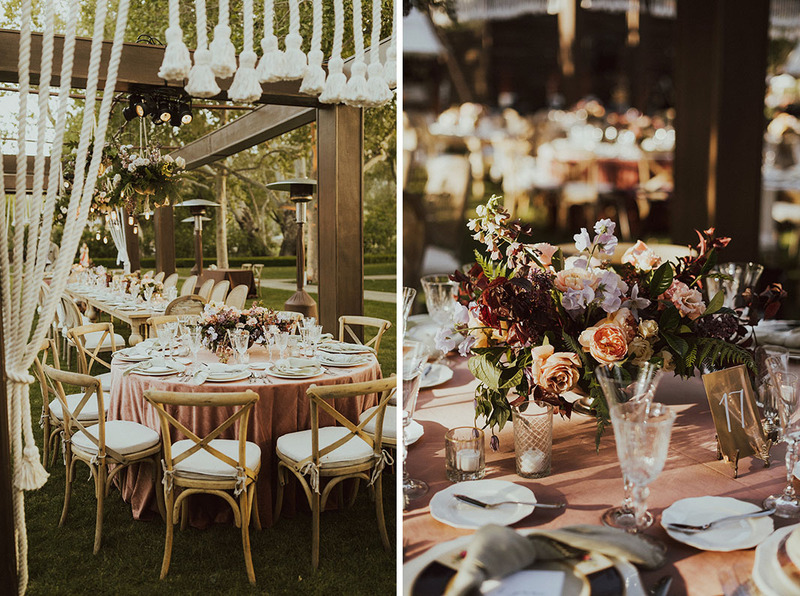 These mix-matched vintage plates added a detail that was so special. 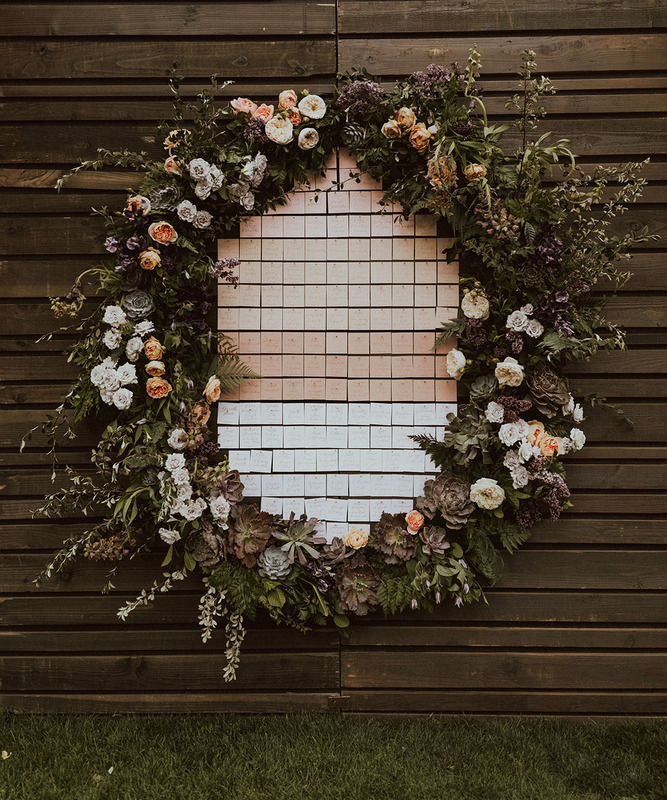 Isn’t this a dream space with the macramé tassel décor by Macramé by Kari and the succulent wall that doubles as a photo booth?! 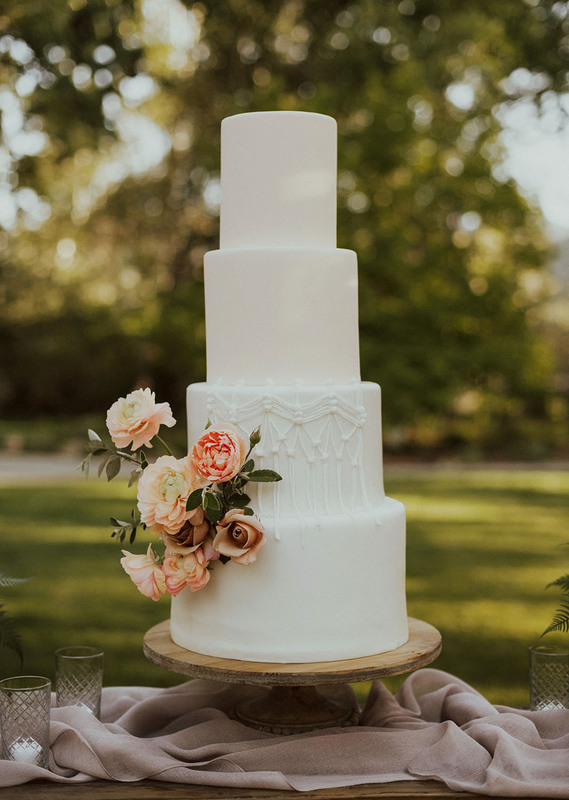 To top everything off, they had a modern + minimalistic cake with a touch of macramé, crafted by the talented creatives at Lele Patisserie. 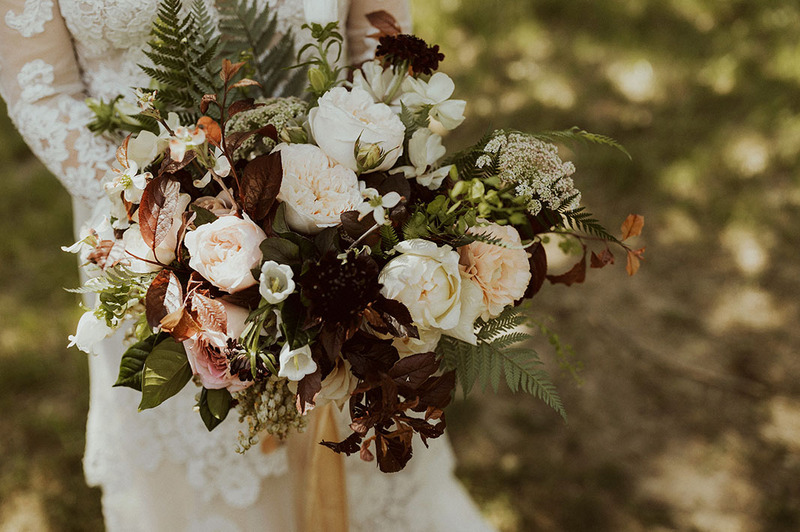 Wow, the tones in all of these images are unreal! Really nice job!!! How cute is the puppy ! Love all the pics captured by the photographer. puppy is very cute and kids are beautiful. Free as a bird! 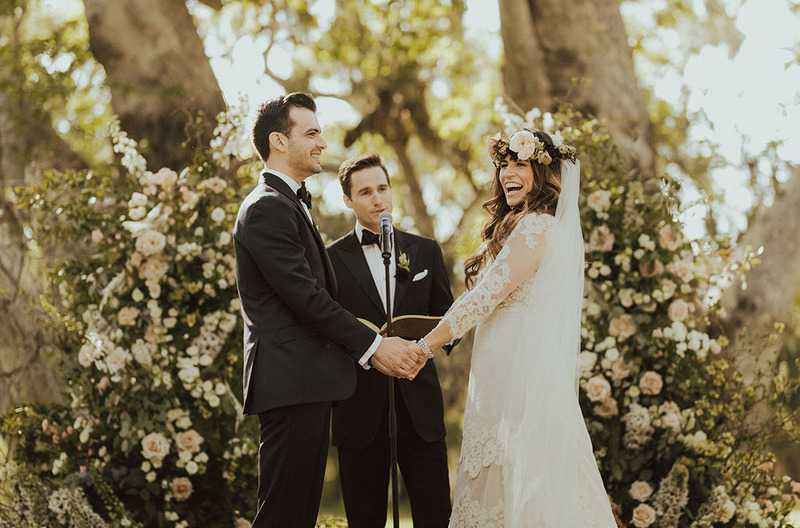 Love the ceremony backdrop!! where are the robes from?